TeamTonia: Fundraising for Tonia's Journey: Capriccio Quartet at The Boathouse, Upton on Severn - This Thursday! Help us raise money for the final leg of Tonia's treatment and ongoing rehabilitation. We're holding a fundraiser and you're invited! Join us on Thursday 28 June 7pm at The Boathouse, Upton on Severn. 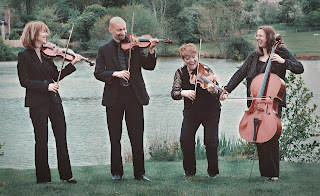 On the night you can enjoy music from the fabulous Capriccio Quartet whilst munching on delicious tapas and supping something chilled and refreshing. We'll be selling raffle tickets on the night and the Capriccio Quartet will be taking requests in return for a donation. Their repertoire is vast, so whether you fancy something classical or a reworking of your favourite pop or rock song, then the chances are they can play it! You can find out more information about the event and RSVP over on Facebook.